Warm Earthy Flavor for Cooking! Sage Vitality Essential Oil and Dietary Supplement supports healthy digestive system* when used as a dietary supplement. Great oil to cook and use in your favorite recipes! Sage Vitality oil is a wonderful flavor enhancer for seafood, vegetables, turkey, breadsticks, corn breads, soups and sauces. Always keep a bottle in your kitchen to spice up your life! As I do receive new information and testimonials for Sage Essential Oil, they will be added to this page. So check back frequently or subscribe to the Oil Blog so you don’t miss a thing! Please read below for more information on Sage Essential Oil. It will tell you how to use it and what to use it for. It will also provide you with some suggestions, safety precautions for you and your pet! 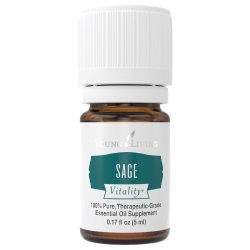 Want to Purchase Therapeutic Sage Vitality Essential Oil? Then go to the Oil Shop! Buy Sage Essential Oil Here! There are over 700 different species of Sage and there are two chemotypes. Many companies may use a substitute species or a combination of species that may not offer the the benefit you are looking for. Remember, even though they may share some similar properties they may be used for different purposes. Where is the name derived from? Sage is derived from Latin word "salvia" meaning "to heal". Did you know that in 812 AD Charlemagne asked that Sage be cultivated and planted on the German imperial farms due to its popularity? What are the Plant Properties? Cleansing and purifying; mentally uplifting. Want to Learn about Sage's Emotional, Spiritual and Other Aspects? Then go to Sage Essential Oil Page! Dietary Supplement: place several drops in capsule with olive oil and take internally. If you prefer dilution, use 50:50 dilution-one part essential oil: one part vegetable oil. Use for healthy digestive system support*. Place in favorite recipe as a seasoning for soups, sauces, marinades, fish, and salad dressings. Don't forget your baking as well! Cookies, breads and cakes! Can this Oil be used for Pets? Yes, however, use very diluted and with caution. I choose to not use it around the horses. I feel that there are other oils with the same benefits that I may use instead. Note about Animal Use: Certain oils can be very toxic to cats. Citrus products and oils in particular that are not of therapeutic grade! Please consult your vet if you are not sure about applying any essential oil to your pet. What are the Safety Precautions? Sage is generally regarded as Safe (GRAS) for internal consumption by the FDA. Also approved by FDA as a Food Additive (FA). However, children of all ages should avoid internal use. Sage essential oil contains thujone. Thujone has been a source of some disagreement, especially within the British School of Aromatherapy because it potentially may have a neruotoxic effect in high dosages if ingested. But, remember, that any product used incorrectly and in high doses may be harmful to the body. With that said, there are other oils that are rich in thujone, including Western Red Cedar Essential Oil (Thuja plicata) and Wild Tansy (Tanacetum annum). So, as with all oils use them properly and when in doubt dilute more than less. This oil should be avoided during pregnancy, by children younger than 5 years old. Additionally, those who have epilepsy or high blood pressure should not use this oil. Did you know that in the Middle Ages because of its properties, Sage was sometimes called S. salvatrix or Sage the Savior? Did you know that the Lakota Indians consider Sage a "master herb" because of its purifying and cleansing properties? Diffuse Sage Essential Oil in you work space to cleanse negative emotions and energies!